For several years now we’ve been wanting to develop an artist-in-residence program here at The Grand, and this past winter we took the first steps to making this dream a reality! Our beautifully renovated third-floor apartment was recently updated to accommodate overnight guests, whether it be a night, a week, or more. This space will allow us to bring in artists and musicians to practice and/or teach their artistry right here at The Grand, and we could not be more excited for what’s to come! We’ve had several artists stay in the apartment already, most notably to help get the Cellar Press up and running. This summer, a wonderful musician will be spending a week here while she conducts CAMP ROCK, which is a summer camp for kids ages 13-18 with an interest in music on the ins and outs of being in a band (more info on that here). Comfortable seating area for relaxing after a busy day exploring the area. The sofa converts to a bed as well. When the space is not being used as part of our artist-in-residence program, it’s available for the public to make reservations on Airbnb. That’s right - you can stay right here in our historic building! You can’t get closer to the action and all that downtown New Ulm has to offer than this. So the next time you or your friends are looking for a place to spend the weekend in New Ulm, be sure to check our apartment first. Keep scrolling to see more of this beautiful space! After a busy day exploring the city, you can come back to a warm and inviting space with all the accommodations of home. Free WiFi, bluetooth-enabled speakers, cable TV, and books and games are all available to help you unwind from the day. In fact, you may never want to leave! 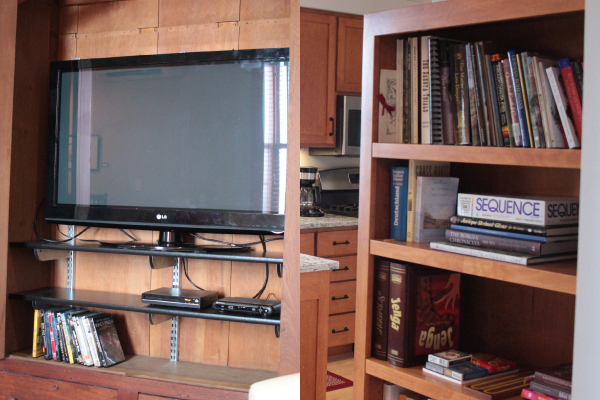 The bookshelf is stocked with fun reads (everything from New Ulm history to fiction) and games. The television is equipped with over 50 cable channels. Separate bedroom features a queen-size bed with fine linens to help you get a good night’s rest! The space is tastefully decorated with artwork from local artists (available for purchase - just let us know! ), and even features a dresser going back to the Grand Hotel days! Large bath features vintage sink (another item dating back to The Grand Hotel days), luxurious towels, full bath tub, walk-in shower, and natural bath products. Extra sheets, towels, a hair dryer, iron and ironing board can all be found in the large closet in the oversized bathroom. A welcome packet (a dish of goodies, too!) awaits you to answer any questions you have about The Grand Apartment or the local New Ulm area. We have thought of everything to make sure you have all the things needed to make your stay as enjoyable as possible. To check availability and rates, head on over to Airbnb. We can’t wait to have you stay with us! Spring Refresh in The Grand Gift Shop!